Manryo (万両), as in ‘10,000 Dollars’? This entry was posted in Uncategorized and tagged Coral berry. Bookmark the permalink. wow that's a red that jumps right off the bush into one's eyes! beautiful…I used to like to watch the Cardinals eat our pyracantha berries! 万両 is common plant among us. The kanji means 10,000 Dollars but I'm not sure whether the name means money. Hi Lrong,Lovely photos-can you eat them or are they just for the birds? 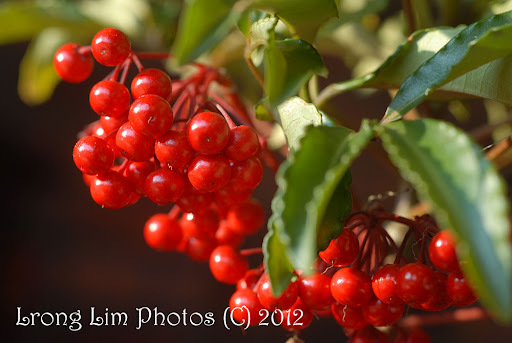 These bright red coral berries will certainly certainly bring cheer to the cold season, like gems and rubies. Like the Japanese name. Glad the berries are a source of food for the birds. 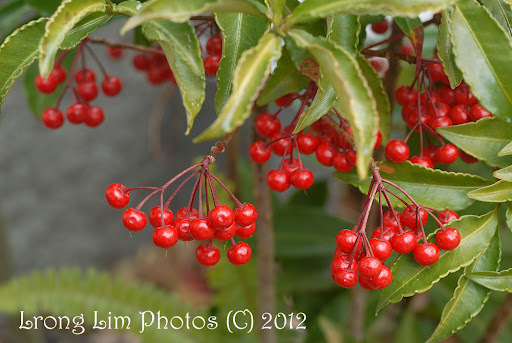 You captured beautifully these bright red berries. Nice shots. Those are lovely photos – your blog always cheers me up with something lovely and colourful – thankyou. I have never seen a real cardinal before… through the net,it seems that they are found only in the American continent… no? It certainly is a beautiful plant…especially in the depths of winter. Love the colour! They'd sure stand out against a winter backdrop. They are not edible? The leaves do have similarities with my passion fruit leaves. I saliva when I saw those berries, so beautiful. Just like a type of "haw" from China. I can see how they would lure the birds to them and see even more clearly why your camera would be tempted! the berry look so yummy! Is it edible? Look like cherry to me! Does it bear 10,000 fruits a time? Have a nice weekend!